The contemporary shape is very appealing and perfect for many smaller cutting chores in the kitchen or in your home bar. One corner has a hanging hole so it's easy to store, but keep on display. 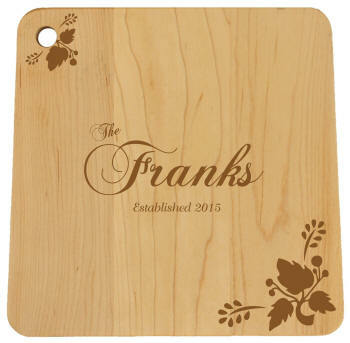 We engrave this cutting board with the family's last name along with the established year and the LEAVES ARE INCLUDED. The engraving is professionally done with a commercial laser engraver. This cutting board has an oil finish. Wash with warm soapy water and dry promptly. Do not put this cutting board in the dishwasher or microwave. Rub frequently with mineral oil to maintain its beautiful finish. Proudly made in USA. Size: 9 1/2 x 9 1/4 x 1/2 in. FSC guarantees that the wood is from a certified well-managed forest and other controlled sources. This collection of cutting boards are small, smart and efficient and made from FSC certified maple by the JK Adams company. This Vermont company has employed the finest woodworkers found in New England. It has been at the same location since the beginning and has employed as many as three generations of families. If you're ever enjoying the fall foliage in Vermont, their fabulous kitchen store is well worth a stop.